At Abington Art Center, works have an affinity for the outdoors. There is no better time than summer to explore sculpture parks, and the Abington Art Center has one of the more abundantly natural ones around. Yes, there are manicured lawns graced by works by such well-known sculptors as Ursula von Rydingsvard, but you will also come across sculptures in its woodlands, all of which are close to trails. The park's sculpture tends toward organic and natural forms - von Rydingsvard's included - not the minimal or hard-edged, which sets it apart from most other sculpture parks. 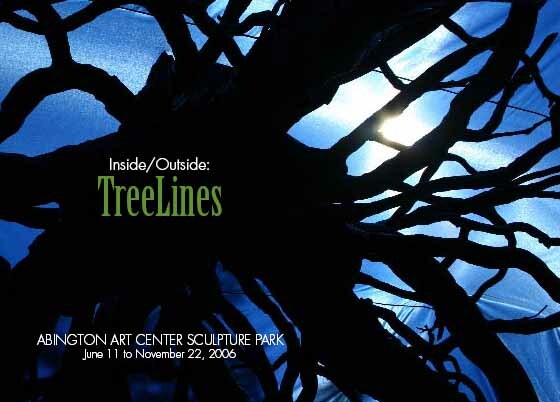 Abington Art Center's latest exhibition, "Inside/Outside: Treelines," organized by the center's curator, Amy Lipton, underscores its predilection for the natural. Each of the artists - Joy Episalla, Robert Lobe, Thomas Matsuda, Jason Middlebrook, Chrysanne Stathacos, and Steve Tobin - has an obvious affection for nature and natural materials that can be seen in the large works installed in the sculpture park and in the smaller works in the center's galleries. The outdoor pieces generally make more of a statement, the indoor exceptions being Lobe's large hammered aluminum sculpture, which seems to swoop out from the wall it is mounted on; Tobin's roomful of "Exploded Clay" pieces, 13 large potlike forms that contain pools of hardened, aqua-colored glass; and Matsuda's wall-mounted segments of burned tree trunk and graphite drawings on handmade paper. Middlebrook, Episalla, and Stathacos outshine the others outside, mainly because you don't commonly encounter whimsical works like these in a sculpture park. By contrast, Tobin's cast-bronze tree roots, Lobe's aluminum treelike form, and Matsuda's five sections of a burned tree trunk, arranged soldierlike in a line, have a more formal, even mournful, presence. Middlebrook's three wood-and-rope squirrel bridges are strung between trees on various parts of the property, and are winsome and funny but also reference monochromatic painting. Each bridge's wood slats are painted in gradations of one color: yellow, orange or green. Stathacos' meditative Refuge, a Wish Garden consists of a real tree at the bottom of the front lawn that she has surrounded with sand, benches, and baskets filled with strips of cloth, rocks, sticks and flowers. You can draw in the sand with a stick, pile up rocks, or tie fabric to the tree, as numerous visitors appear to have done. The least likely outdoor work is Episalla's large scrim photographic mural printed on semitransparent vinyl mesh. Hung between two trees in the woods, the mural depicts a vastly enlarged color picture of the Grand Tetons that Episalla found in her late father's office; it is a bit like a mirage or an English folly. The mural will be interesting to see in November against a barren backdrop of leafless trees, as Lipton points out, but it's plenty amusing now. Abington Art Center, 515 Meetinghouse Rd. Jenkintown, 10 a.m. to 5 p.m. Tuesdays through Fridays (Thursdays to 7 p.m.), 10 a.m. to 3 p.m. Saturdays. (The sculpture park is open daily during daylight hours.) Indoor exhibition through July 29; outdoor installation through Nov. 22. Information: 215-887-4882 or www.abingtonartcenter.org.